• Read more projector screen reviews from the writers of Home Theater Review. • See related articles in our Video Projector Review section. Despite its low asking price of just $279, the 9100SE is a highly versatile screen with a lot of worthwhile features. The package includes both an RF remote control and a wireless 12-volt trigger that allows you to easily set up the screen to automatically drop and rise in sync with projector power-up/down. There's also an RS-485 port and cable for integration into a more advanced control system. 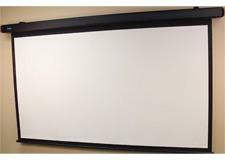 The screen has black backing to prevent light penetration and about 1.5 inches of black border around the sides and bottom, plus 18 inches of extra black drop at the top, which gives you more flexibility to position the screen as your projector's throw angle demands. The 9100SE's build quality was more impressive than I expected at this price point, with a sturdy aluminum casing and matching L-shaped brackets that allow for ceiling- or wall-mounting. The package includes 1.25-inch wood screws and plastic wall anchors to attach the L brackets to your wall or ceiling, but I went ahead and used the three-inch lag bolts that were already in the studs in my ceiling from a former screen installation. The screen weighs about 30 pounds, so I felt more comfortable sticking with the longer woodscrews over the shorter options that came in the package. In my case, setup was simple because my husband and I have done this before; one especially helpful feature is the ability to easily shift the screen case from side to side within the L brackets in order to fine-tune the placement. If this is your first screen install, be aware that this is definitely a two-person job, and be warned that the manual isn't much help. It's written in broken English (the screens are produced in China), and it consists primarily of small diagrams that don't offer a lot of guidance. 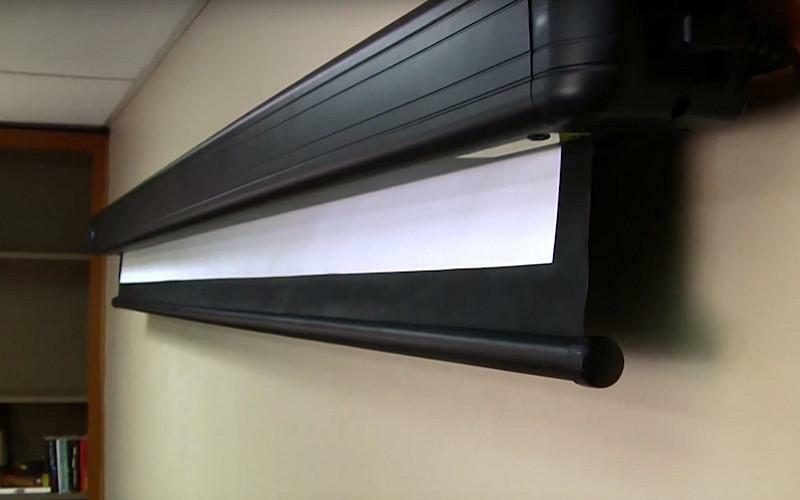 Visual Apex's dedicated screen website offers an installation video, but it skips over the basic mounting procedure and goes right to setting up the 12-volt trigger and locking the screen drop at a desired length. Visual Apex has a reputation for excellent customer service, so don't be afraid to give them a call if you need assistance with the physical installation. When I first lowered the screen, the glass-fiber material came out looking fairly smooth. Of course, a non-tensioned screen is never going to be as taut as a tensioned or fixed-frame model. The 9100SE had a few small curves near the outer edges, but nothing significant enough to blatantly affect performance, and the material continued to smooth out over a few weeks of use. The motor is not whisper-quiet, nor is it obnoxiously loud. Using an SPL meter, I got an average reading of about 30 decibels in my room. I tried out the screen with two different projectors, the Sony VPL-HW30ES SXRD projector and the Epson Home Cinema 1080 LCD projector, and I was impressed with its quality. Brightness uniformity was very good across the screen, with no blatant hot-spotting in the center. The screen material's texture is fine enough to not introduce any significant footprint of its own. Sitting within ten feet of the screen, I saw nothing to visibly detract from or interfere with the quality of the projected image. Read about the high points and low points of the 9100SE on Page 2.